Including the "inside jokes" he put in "The Hangover" during his wife's cancer battle. Sometimes I need someone to wipe my tears when I’m having relationship problems. Begging for Scraps: The Impoverished Satire of "War Dogs"
Brought to you by Todd Phillips, director of The Hangover and its two mangled offspring, War Dogs stars Jonah Hill (in what could either be an ill-advised buy-in or half-hearted middle finger to his new status as a "serious" actor) and Miles Teller as two young gunrunning guns out to make a quick buck off the War on Terror. We're not so easily fooled. Fifty minutes of Brody "Positive energy!" Stevens is a spectacle both formidable and profound. My favorite can-do town loves to reinvent itself, and it's at it again. Nothing too jarring, though; more of a slow roll. And it's left some confusion among the local populace. Yes, yes, I know -- spidermanspidermanspidermanspiderman. I'll get to it. But my favorite movies of the week, as usual, are the small ones. Let's start with Amma Asante's Belle, a Jane Austen-ish film based on a true story. Like a bro who's circled back to pick up his anchor baby, we're back for episode 3 of Mixology, charting the odds of our 10 singles in their quest of love and/or lust in NYC. In today's day and age the general public at large cannot be won over by just a paid message from a beloved celebrity figure. Those days are over. That is no longer a guarantee alone to capture our attention. We get the game. The hangover could be settling in earlier than expected for ABC's Mixology, the show about what happens to 10 singles over the course of a single night out in New York City. While it's far too early to know who ends up with whom and who inevitably goes home alone, it's always fun to speculate, isn't it? So that's exactly what we'll do. With 1 being "A snowball's chance in hell" and 10 being "They're probably in a bathroom stall right now," we'll take a weekly look at our singles' odds of getting lucky. If we are not aware of what's going on when we are in these patterns or if we experience resistance to the healing process. Then we will go in and out of awareness when things remind us of a place we have been before and in no ways want to repeat. A clutch of Emmy-winning TV shows are outshone by the return of Foyle's War, a British mystery series that's regained its footing. Also out now are two more great Criterion releases, the godawful Hangover III and a clutch of movies perfect for Halloween. Comedy is subjective, so there are bound to be haters for We're the Millers. But, speaking as someone who enjoys vulgar humor that is both mean and smart, I can tell you that I laughed a lot during this brisk, consistently funny movie. The MovieFilm Podcast: Hangover III, Fast 6, and After Earth! 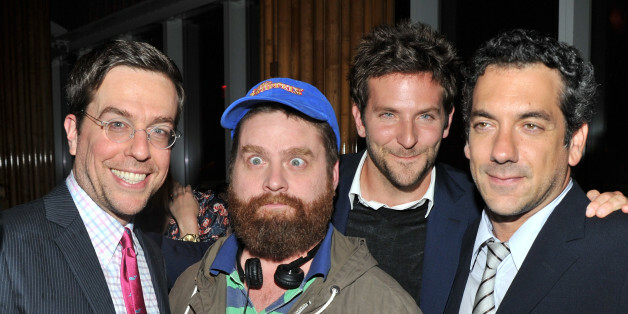 Box Office: What's Behind the Woozy Debut of 'The Hangover Part III'? With great respect for the trilogy's swan song, I decided a top ten list was in order. So here it is: The Top Ten Reasons to go see The Hangover III. I heartily endorse the original Hangover. Now we've got Part III. And yes, I recognize that the Roman numeral is meant as a joke -- but I have to point out that it's about as funny as many of the gags in this uneven and busy film.